Artists came out of their studios and closets, by confessing to their obsessions in a new book. Co-edited by artists Cornelia Erdmann and Michael Lee Hong Hwee, Preoccupations: Things Artists Do Anyway is an anthology that aims to explore hobbies and obsessions that drive artists. It features 111 international artists from Hong Kong, Singapore, and other cities in Asia, Europe and USA. They are from different creative disciplines in the visual, literary and performing arts, as well as the applied arts of film, design and architecture. The book was already launched twice so far. 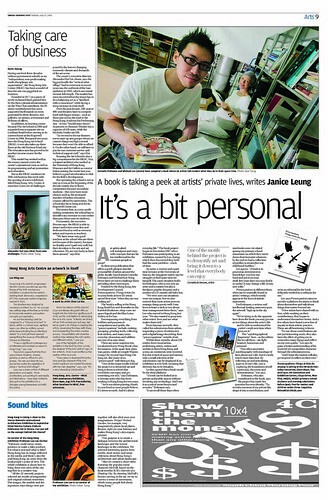 On Sat, 19 Jul 2008, it debuted at the Kubrick Bookshop Cafe, Hong Kong, with the company of contributors, supporters and the public. Hosted by the editors Cornelia Erdmann and Michael Lee, the launch began with a recollection by the editors of the editorial process. The editors recalled the genesis of the project as an earlier conversation about what activities of artists might be most interesting. "What do artists do in their free time?" "What makes their mind tick?" These initial questions led to the conception of a project that aimed to take a peek into artists' private lives and thereby offer insights into their art. An Open Call and Special Invitation process yield overwhelming responses from the artists. Eventually, 100 contributions comprising 111 artists were selected to be included in the book's first edition. The Hong Kong launch, held in-conjunction with the Hong Kong Book Fair 2008, also included a reading session by select contributors: Nadim Abbas shared on his passion for cooking, while Kacey Wong revealed his weekend pastime: war games. Warren Leung and Sara Wong shared on their relationship wth their pet dog BB, while for han, dancing seems to be the best way to releave stress. Brendan Goh and Yuk King Tan both shared on their preoccupation with gossip. The Singapore launch on Sat, 13 Sep 2008, at Food #03 @ Post-Museum, played host to an event bigger audience. Many of the attendees were Singapore-based artists, who made up half of the contributors. Others were guests of the 2nd Singapore Biennale 2008, of which the book launch was a parallel event. After welcoming the guests and introducing the book, host Michael Lee passed the stage to 7 presenters to share their quirks and passions: Robert Guth started the ball rolling on Bulldozers, which he adores. Then Matthew Teo showed a series of photographs that traced his diptych series that features his father and him separately posing in the same manner. This was followed by Michael Tan's sharing on his particular taste for unsoggy toasts. Jacklyn Soo followed up with the private things she does with her body, before crooning two songs she penned herself. Susie Wong brought a prop - a packet of her favoured drink, namely, teh si kosong (tea with evaporated milk, no sugar) - to mull over the tacit relations of an individual and the community. Sherman Ong, a participant of the Singapore Biennale this year, demonstrated why and how he collaged three internet news articles to form a new one. The project was generously supported by Hong Kong Arts Development Council and National Arts Council, Singapore.